For the village located within this town, see Argyle (village), New York. Argyle is a town in Washington County, New York, USA. It is part of the Glens Falls Metropolitan Statistical Area. The town population was 3,782 at the 2010 census. The town was named by its many early settlers from Scotland after Argyllshire. The town of Argyle has the village called Argyle within its borders. Largely an agricultural community since its founding the town is now experiencing an almost 80 year period of population growth, according to the US Census Bureau, fueled by abundant land and proximity to nearby work, cultural and outdoor activities. Argyle Town government consists of a town board (an elected town supervisor and four town council members). The town has fire protection provided by the J.A. Barkley Hose Company No. 1/Argyle Fire-Rescue and near Cossayuna Lake in the southeast portion of the town also by the Cossayuna Volunteer Fire Department. The Argyle Rescue Squad provides emergency medical service. Law enforcement is provided by New York State Police from Troop G, the Washington County Sheriff's Office and by officers of the New York State Department of Environmental Conservation Region 5 office. Children of school age in both the village and town of Argyle who use public schools attend Argyle Central School except for a small area in the northwestern portion of the town where students attend Hudson Falls public schools. Some notable community events include; a Memorial Day parade led by Argyle American Legion Post 1518, an annual 4th of July parade and chicken barbeque hosted by the men and women of the Argyle Fire-Rescue Department along with many additional community volunteers, the Argyle Methodist Church Election Dinner, a Thanksgiving Holiday meal (delivered, take out or sit down) provided by F.E.A.S.T (friends ensuring a super thanksgiving) for those wishing to enjoy a traditional thanksgiving meal, a book fair by the Argyle Free Library on July 4th, the Carl Lufkin Memorial Pull for the Cure - a Garden Tractor and 4WD truck pull in July which raises money for several charities helping in the fight against cancer, a haunted house on weekends in October at the Ransom Stiles house, a town-wide garage sale over the Columbus Day Holiday, and monthly pancake dinners hosted by Argyle American Legion. 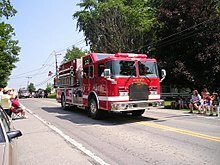 Argyle Fire-Rescue Department fire engine in Argyle, New York 4th of July parade. Argyle is the largest dry town in New York State. In 1983, the former Camp Algonquin summer camp on Summit Lake was the film location for the cult slasher movie Sleepaway Camp. The Town of Argyle will be near the path of totality (98.5%) during the Solar eclipse of April 8, 2024 according to the WEB site timeanddata.com. The communities of Lake Placid, Potsdam and Plattsburg and many locations in the nearby Adirondack Park will be within the path of totality. The time of maximum solar eclipse in Argyle will be at 3:27.05 pm. 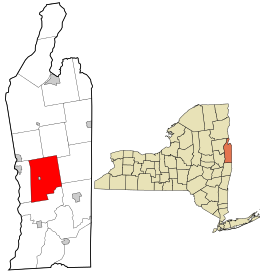 The town was formed from the Argyll Patent of 1764 while still in Albany County, Province of New York and became a town in Charlotte County when it was created 24 March 1772. Following the American Revolution, in 1784 the State of New York renamed Charlotte County as Washington County. During the time of the 9th New York State Legislature Argyle was officially formed as a town on 23 March 1786. Since many of the original settlers were from Argyll, Scotland, they adopted the name of their native land to the town. Although population growth was slow, the town was the most populous in the county by 1790. In 1803, part of the town was used to establish the new Town of Greenwich. In April 1818, an additional portion of the town was taken by legislative act by the New York State Legislature to establish the Town of Fort Edward. During the American Civil War, more than 90 men of Argyle and nearby Greenwich enlisted with the 123rd New York Volunteer Infantry Regiment Company F, according to the New York State Military Museum. The 123rd's ten companies were almost entirely filled with local men from towns within Washington County. The 123rd was mustered into service at Salem, NY on 4 September 1862. Among the many battles fought, the 123rd participated in the Battles of Chancellorsville, Gettysburg, Atlanta, and the March to the Sea. Following the Grand Review of the Armies in May 1865, the Regiment was mustered out of service near Washington D. C. on 8 June 1865. Additional New York volunteer infantry regiments which also, at times, contained soldiers from Argyle and from nearby communities in Washington County according to "The History of Washington County" published in 1878, were the 22nd, 43rd, 44th, 93rd and 96th Infantry Regiments and the 2nd Cavalry and Harris Light Cavalry units. According to the United States Census Bureau, the town has a total area of 57.8 square miles (149.7 km²), of which, 56.7 square miles (146.8 km²) of it is land and 1.1 square miles (2.9 km²) of it (1.92%) is water. The town mainly lies in the foothills of the narrow northern ridge of the Taconic Mountains. In the western area of the town farmland and small wooded lots are considered part of the Hudson River valley. A portion of these farmlands are also within the Washington County Grasslands , an approximately 13,000 acre area which is a winter roosting site for state endangered short-eared owls; winter and breeding ground for other threatened and declining grassland birds, including Northern Harrier, Horned Lark, Upland Sandpiper, Eastern Bluebirds and Bobolinks. Snowy Owls are also regular visitors. In the eastern part of the town elevations increase with several mountains reaching over 1,000 feet in height. From many locations in Argyle the Adirondack Mountains can be viewed to the north and west and the Green Mountains of Vermont can be viewed to the east. NY Route 40 is a north-south highway in the town and NY Route 197 is an east-west highway leading to/from nearby Fort Edward. As of the census of 2000, there were 3,688 people, 1,313 households, and 1,000 families residing in the town. The population density was 65.1 people per square mile (25.1/km²). There were 1,798 housing units at an average density of 31.7 per square mile (12.2/km²). The racial makeup of the town was 98.94% White, 0.22% Black or African American, 0.03% Native American, 0.03% Asian, 0.27% from other races, and 0.52% from two or more races. Hispanic or Latino of any race were 1.03% of the population. There were 1,313 households out of which 37.2% had children under the age of 18 living with them, 63.4% were married couples living together, 8.4% had a female householder with no husband present, and 23.8% were non-families. 17.6% of all households were made up of individuals and 6.9% had someone living alone who was 65 years of age or older. The average household size was 2.71 and the average family size was 3.07. In the town, the population was spread out with 26.5% under the age of 18, 6.3% from 18 to 24, 29.0% from 25 to 44, 24.9% from 45 to 64, and 13.3% who were 65 years of age or older. The median age was 38 years. For every 100 females, there were 94.8 males. For every 100 females age 18 and over, there were 91.8 males. The median income for a household in the town was $41,133, and the median income for a family was $44,414. Males had a median income of $32,253 versus $21,250 for females. The per capita income for the town was $20,403. About 5.3% of families and 7.6% of the population were below the poverty line, including 11.3% of those under age 18 and 7.7% of those age 65 or over. John Allen Family - Frontier family living in South Argyle who were massacred on 25/26 July 1777 by Native Americans attached to British General John Burgoyne's Army as they were moving southwards toward the Battles of Saratoga during the American Revolutionary War. Alexander Barkley - New York State Republican Legislator during 1865-1866 who lived and died in Argyle. He won statewide election in 1871 and served as Canal Commissioner from 1872-1874. Evelyn Clark Colfax - Born in Argyle in 1823 and married Schuyler Colfax (Speaker of the U.S. House of Representatives 1863-1869 and first Vice President for Ulysses S. Grant) on 10 October 1844 at the family home in Argyle. Edward Dodd - Moved to Argyle in 1835 from nearby Salem, New York and served as a member of the U.S House of Representatives from 1855 to 1959. He was an early member of the Republican Party. Julia Spencer-Fleming - Author of mystery novels set in fictional Millers Kill, New York who lived and attended school in Argyle in the 1970's. John Alexander McGeoch An American psychologist and educator who was born in Argyle in 1897. Considered a modern functionalist, his interests focused on human learning and memory. He was the chair of the department of psychology at the University of Missouri from 1930-1935, Wesleyan University from 1935–1939, and University of Iowa from 1939–1942. Grandma Moses - Renowned American folk artist worked for a time in Argyle. Solomon Northup - Abolitionist, kidnapped and sold into slavery, who authored the book "12 Years A Slave" lived for a brief time in Argyle. Robert S. Robertson - U.S. Congressional Medal of Honor recipient from the Battle of Corbin's Bridge in May 1864. He was born and raised in North Argyle and after the American Civil War was elected Lieutenant Governon of Indiana in November 1886. Robert B. Scott - U.S. Congressional Medal of Honor recipient from a battle during the U.S. - Indian War in 1869. He is buried in Argyle's Prospect Hill Cemetery. David Sheridan - Inventor of catheters and philanthropist who created three medical catheter plants in North Argyle thus employing thousands. Argyle – A village within the town, located on NY-40. Argyle Airport (1C3) – A grass strip airport northeast of Argyle village. Durkeeetown – A location at the west town line on County Road 45. Goose Island – A hamlet east of Argyle village on County Road 47. Lick Springs – A location west of South Argyle. North Argyle – A hamlet northeast of Argyle village on NY-40. South Argyle– A hamlet south of Argyle village on NY-40. The Hook – An area on County Road 45 where there were once hotels for travelers along a coach road and recently a restaurant called the Hook Pantry, but it has been converted into a house. Barkley Mountain – An elevation east of the community of Argyle (627 feet (191 m)). Cossayuna Lake – The largest body of water in the town, located in the southeast corner (Elevation 422 feet (129 m)). Dead Creek – A stream exiting from Argyle at the west town line. Headwaters of Wood Creek – A stream exiting from Argyle near the northwest corner and running up to Lake Champlain. Moses Kill – A stream passing through North Argyle and Argyle village. Mud Pond – A small lake north of Goose Island. Murdock Mountain – An elevation north of Summit Lake (1,014 feet (306 m)). Summit Lake – A lake west of Cossayuna Lake. Tamarack Swamp – A swamp by the north town line. Todd Mountain – An elevation northwest of Goose Island (1,038 feet (315 m)). ^ "The Dry Life". CNN. Retrieved January 8, 2014. This page was last edited on 17 January 2019, at 00:53 (UTC).